Kris Kremers and Lisanne Froon were Dutch students who died on or shortly after April 1, 2014, while hiking in Panama. After an extensive search, portions of their bodies were found a few months later. Their cause of death could not be determined definitively, but Dutch authorities working with forensic and search-rescue investigators thought it likely the students had accidentally fallen from a cliff after becoming lost. The circumstances and aftermath of their disappearance have resulted in much speculation about the cause of death. Foul play could not be entirely ruled out and Panamanian officials came under fire for allegedly mishandling the disappearance and aftermath. Further investigation into the case in 2017 uncovered enough new evidence to suggest foul play, as well as a possible link to other murders in the area. Lisanne Froon, 22, was described as aspiring, optimistic, intelligent, and a passionate volleyball player, and Kris Kremers, 21, as open, creative, and responsible. Both grew up in Amersfoort. Froon had graduated with a degree in Applied Sciences from Deventer the previous September, and Kremers had just completed her studies in cultural social education, specializing in art education at the University of Utrecht. Only a few weeks prior to leaving for Panama, Froon had moved in with Kremers in a dorm room in Amersfoort, and they worked together at the café/restaurant 'In den Kleinen Hap'. They both saved up money for six months and planned to go to Panama together on a special trip to learn Spanish, as well as to do something of significance for the locals, particularly volunteering with children. The trip was also supposed to be a reward to Froon for graduating. Kremers and Froon arrived in Panama for a six-week vacation on March 15, 2014. They toured Panama for two weeks before arriving in Boquete on March 29 to live with a local family for a month while volunteering with children. On April 1, they went hiking with their hosts' dog around 11:00 near the clouded forests that surrounded the Baru volcano, possibly the trail of Pianista, not far from Boquete. They wrote on Facebook that they intended to walk around Boquete, and it was reported that they had been seen having brunch with two young Dutch men before embarking on the trail. Their hosts became alarmed when their dog returned home that night without the young women. Froon's parents stopped receiving text messages, which both women had been sending to their families daily. On the morning of April 2, Froon and Kremers missed an appointment with a local guide. On April 3, authorities began aerial searches of the forest and local residents began searching. On April 6, the parents of Kremers and Froon arrived in Panama along with police, dog units, and detectives from the Netherlands to conduct a full-scale search of the forests for ten days. The parents offered a US$30,000 reward. Ten weeks later, a local woman turned in Froon's blue backpack, which she said she had found in a rice paddy by a riverbank near her village of Alto Romero, in the Bocas del Toro region. She said she was sure it had not been there the day before. The backpack contained two pairs of sunglasses, US$83 in cash, Froon's passport, a water bottle, Froon's camera, two bras, and the women's phones – all packed, dry, and in good condition. The women's phones showed that some hours after the start of their hike, someone had dialed 112 (the international emergency number) and 911 (the emergency number in Panama). The first distress call had been made just hours after beginning their hike: one from Kremers's iPhone at 16:39 and shortly after that, one from Froon's Samsung Galaxy at 16:51. None of the calls had gone through due to a lack of reception in the area except for one 911 call attempt on April 3 that lasted for a little over a second before breaking up. After April 5, Froon's phone battery became exhausted after 05:00 and was not used again. Kremers's iPhone would not make any more calls either but was intermittently turned on to search for reception. After April 6, multiple attempts of a false PIN code were entered into the iPhone; it never received the correct code again. 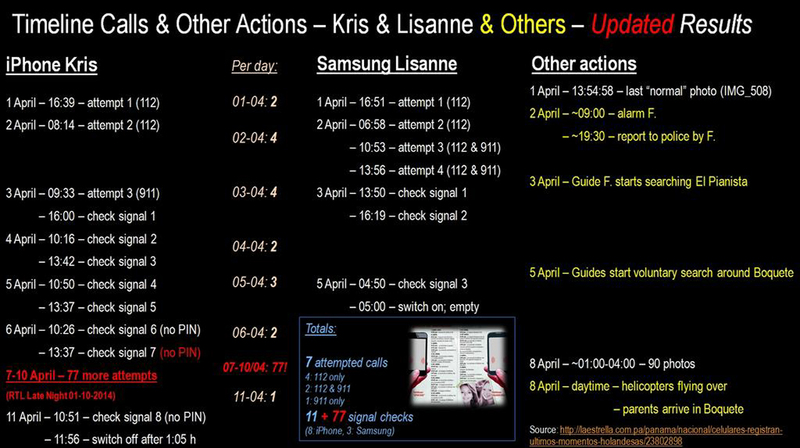 One report showed that between 7 and 10 April, there were 77 emergency call attempts with the iPhone. On April 11, the phone was turned on at 10:51, and was turned off for the last time at 11:56. Froon's camera contained photos from April 1 suggesting that the women had taken a trail at the overlook of the Continental Divide and wandered into some wilderness hours before their first attempt to reach 911, but with no signs of anything unusual. On April 8, ninety flash photos were taken between 01:00 and 04:00, apparently deep in the jungle and in near-complete darkness. A few photos show that they were possibly near a river or a ravine. Some show a twig with plastic bags and candy wrappers on top of a rock, another shows what looks like toilet paper and a mirror on another rock, and another shows the back of Kremers's head with what looks like blood by her temple. The discovery of the backpack led to new searches along the Culebra. Kremers' jean shorts, zipped and neatly folded, were found atop a rock on the opposite bank of the tributary a few kilometers away from where Froon's backpack had been discovered (although later witnesses would claim the jeans were not neatly folded but found in the river itself). Two months later, closer to where the backpack was discovered, a pelvis and a boot with a foot inside were found. Soon at least 33 widely scattered bones were discovered along the same river bank. DNA testing confirmed they belonged to Froon and Kremers. Froon's bones still had some skin attached to them, but Kremers's bones appeared to have been bleached. A Panamanian forensic anthropologist later claimed that under magnification "there are no discernible scratches of any kind on the bones, neither of natural nor cultural origin—there are no marks on the bones at all." ^ "Vermist - Lisanne Froon - 112Regio.nl". www.112regio.nl. Retrieved 2016-10-15. ^ a b "Kris & Lisanne likely fell off cliff in Panama: investigators". 4 March 2015. ^ "Missing in Panama — A Mystery Deepens - Mostly Mystery". ^ Kryt, Jeremy (2016-07-24). "Death on the Serpent River: How the Lost Girls of Panama Disappeared". The Daily Beast. Retrieved 2016-10-15. ^ a b "Cronología de la búsqueda de Kris y Lisanne". TVN. Retrieved 2016-10-15. ^ Kryt, Jeremy (2017-05-13). "Did a Serial Killer Stalk the Lost Girls of Panama?". The Daily Beast. Retrieved 2018-05-24. ^ Kryt, Jeremy (2017-05-16). "Lisanne, Kris, Catherine—Will the Panama Cases Ever Be Solved?". The Daily Beast. Retrieved 2018-05-24. ^ "About Lisanne". Foundation to Find Kris & Lisanne. 2014-05-08. Retrieved 2017-09-20. ^ "About Kris". Foundation to Find Kris & Lisanne. 2014-05-08. Retrieved 2016-10-15. ^ "Hunt for girls missing in Panama scaled down, Dutch men being questioned". DutchNews.nl. 2014-04-15. Retrieved 2016-10-15. ^ a b Visser, Jeremy Kryt|Nadette De (2016-07-30). "The Last Man to See the Lost Girls of Panama Alive". The Daily Beast. Retrieved 2016-10-15. ^ "Missing: Two Dutch Nationals". ^ a b c Visser, Jeremy Kryt|Nadette De (2016-08-07). "The Lost Girls of Panama: The Camera, the Jungle, and the Bones". The Daily Beast. Retrieved 2016-10-15. ^ a b "Dutch girls' camera took 90 photos in 3 hours". La Estrella de Panamá. 2014-10-07. Retrieved 2016-10-15. ^ Anonymous (2014-06-19). "Indígenas han sido pieza clave en investigaciones". Panamá América (in Spanish). Retrieved 2017-09-20. ^ Kryt, Jeremy (2017-05-15). "Deep Inside the Panama 'Paradise' Murder Mysteries". The Daily Beast. Retrieved 2018-05-24. ^ Kryt, Jeremy (2017-05-16). "The Lost Girls, The Bones, and the Man in the Panama Morgue". The Daily Beast. Retrieved 2018-05-24. 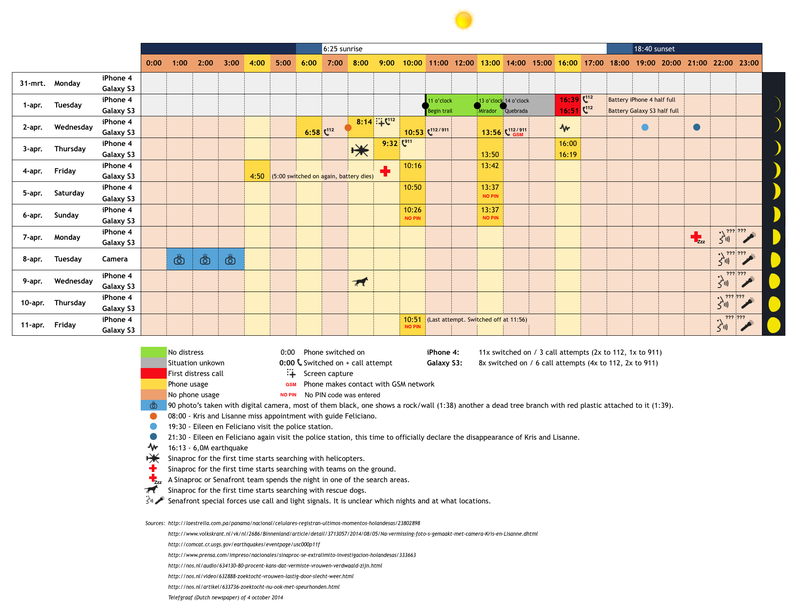 This page was last edited on 15 April 2019, at 23:16 (UTC).